November 6, 1893: Death of Tchaikovsky.“On 6 November 1893, nine days after the premiere of his Sixth Symphony, the Pathétique, Pyotr Ilyich Tchaikovsky died in Saint Petersburg, at the age of 53. The official cause of death was reported to be cholera, most probably contracted through drinking contaminated water several days earlier. This explanation was accepted by many biographers of the composer. However, even at the time of Tchaikovsky’s death, there were many questions about this diagnosis. This entry was posted in Year 7 TDIWH and tagged cholera, drinking water, Russia, Tchaikovsky, water, water history on November 6, 2018 by safedrinkingwaterdotcom. 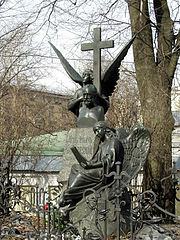 November 6, 1893: Death of Tchaikovsky. “On 6 November 1893, nine days after the premiere of his Sixth Symphony, the Pathétique, Pyotr Ilyich Tchaikovsky died in Saint Petersburg, at the age of 53. The official cause of death was reported to be cholera, most probably contracted through drinking contaminated water several days earlier. This explanation was accepted by many biographers of the composer. However, even at the time of Tchaikovsky’s death, there were many questions about this diagnosis. This entry was posted in Year 6 TDIWH and tagged cholera, drinking water, Russia, Tchaikovsky, water, water history on November 6, 2017 by safedrinkingwaterdotcom. This entry was posted in Year 5 TDIWH and tagged cholera, drinking water, Russia, Tchaikovsky, water, water history on November 6, 2016 by safedrinkingwaterdotcom. This entry was posted in Year 4 TDIWH and tagged cholera, drinking water, Russia, Tchaikovsky, water, water history on November 6, 2015 by safedrinkingwaterdotcom. This entry was posted in Year 3 TDIWH and tagged cholera, drinking water, Russia, Tchaikovsky, water, water history on November 6, 2014 by safedrinkingwaterdotcom. This entry was posted in Year 2 This Day in Water History and tagged cholera, drinking water, Russia, Tchaikovsky, water, water history on November 6, 2013 by safedrinkingwaterdotcom. This entry was posted in This Day in Water History and tagged cholera, drinking water, Russia, Tchaikovsky, water, water history on November 6, 2012 by safedrinkingwaterdotcom.